I'm taking the steps towards this. Over the next few days I'll be working on my graduate application to Kent State University School of Library and Information Sciences. At this point, what do I have to lose right? Keep your fingers crossed for me! Last week, Chickbug shared this with me and I want to share it all with you. Its a great reminder that no matter what happens, the end result will be spectacular. 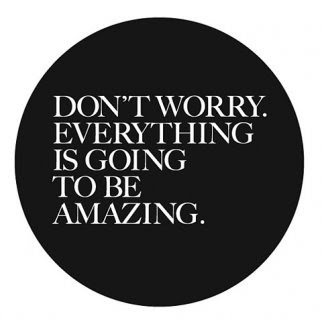 yes, everything will be amazing. At least I really hope so! Mmm. And fingers crossed. You have nothing to lose! I'm behind you ALL the way! LOVE that you are doing what you want to do and LOVE Chickbug's reminder. So true. Fingers crossed, well wishes heading your way and many happy thoughts radiating to the Kent State admissions office for you too! I love that! You should print it out and put it on the fridge and bathroom mirror. Good reminder in both places! Besides you know you can always count on your bloggie friends for support! SO happy for you. SO proud of you. You will be great!!! YAY! You will do great! How exciting! Grad school is hard work but certainly worth it :) Do you want to work in a public library, at a school, etc? oh how cool!! i wish you some serious luck - it's like a fun new adventure right?!?! That really is exciting!!!!!!!!! I am so proud of you for taking this step for going after what you want! I totes need to keep this up at my desk because I have a tendency to overreact. Good advice! my fingers are crossed for you! just the fact that you've made this step...it's such an accomplishment. I'm so excited for you. Good luck with everything. Yeah!! I'm so happy for you. When you send that application it will have all of my positive thoughts and best wishes going with it! Congratulations!!! I am looking forward to hearing all about it!! About 8 years ago my 10 year plan included getting the same degree. My life has taken a much different direction and I am very happy. However, I do often think about it. I hope that you will be willing to share some of your experiences so that I can feel like I am part of it! so simple, yet it makes you feel so...relaxed, that saying. good luck! Good luck on your applications. I love that 'sign' that ChickBug sent you. I need to remember that. At this point, all you have to lose is a little time and an application fee. Definitely worth it in my book. Go you! YAY!!!!!! Go Mandy!!!! It was so hard to leave me job to go back to law school, but I finally have realized that it was 110% worth it. Also, I absolutely can't afford it and I'm now 6 figures in debt, but I hope I remember each time I pay my student loan bill that the borrowed money helped me get the job I really, really want--a lawyer who advocates for abused kids & women. If it's right for you, you'll find a way. SO FREAKING PROUD & EXCITED FOR YOU! Just a heads up---I responded to your comment on my blog. It is in the comment section under my latest entry!!!! Talk to you soon. Have a great time this weekend. I will be thinking of you and wishing I was there. p.s. I have that graphic set as my background at work. I'm doing a happy dance for you! So exciting. Honestly, I didn't think that my grad experience would be as amazing as it has been. I may complain about how busy I am and how hard it is, but I love every second of it.